It’s Saturday! How you doin’? 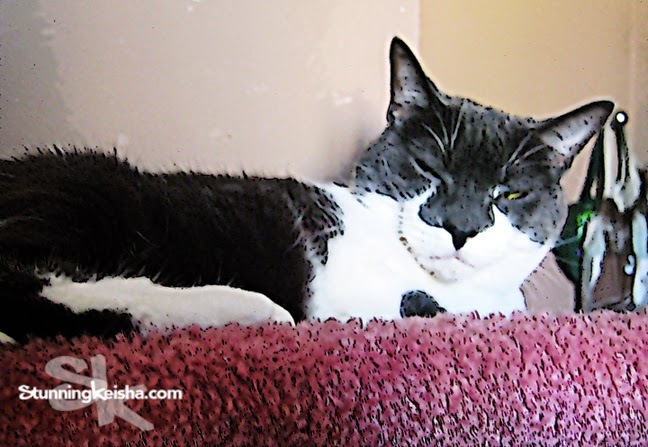 Every Saturday I participate in the Caturday Art Blog Hop, hosted by Athena and her Mum Marie. Most weeks the art is fantabulous and worth your time to peruse, if I may use a Sunday word on Saturday. Perhaps you could try your hand using Photoshop or one of the many online photo editors. About my art: the image above started as a soft focus blur. First we used the “Cartoon Art" Photoshop action. Oddly enough, we amped up the visual blur effect. Then we decided to try the watercolor action on the same image. We didn’t play with the settings cos we like how much it looks like a real painting. Would you hang a watercolor of ME on your wall? Do you have any special plans this long Memorial Day weekend? 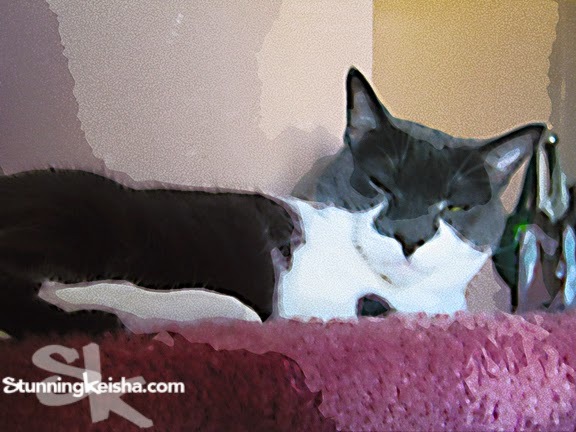 Of COURSE we'd like a watercolor of you, CK!!! Not much for Memorial Day plans... just a lotta lotta packing for the big trip to Nashville! Want to take bets on who has the heaviest suitcase? My human has so many pictures that need to be put on the wall! They are framed and everything - but she is so unorganized about anything decorative. Of course I would hang a stunning picture of you on my wall, or better still, in my mancave. Your picture is beautiful this week, CK. But considering the subject matter, it's not surprising! We like your art this week CK. Simple, but stunning. Love your beautiful painting! Please do more with this stunning picture! (hint, hint). It does look like a painting of you beautiful CK. Thanks for visiting us on our blogoversary and for being our friend. XO I hope to get to meet TW in the near future. That would look good on any wall! CK your art is fantastic and we agree it would make a terrific piece of art for the wall. Your human is so creative. My mom lacks that. My weekend has been shot to heck because mom offered to take care of the neighbor's beast. Not only does it come in my yard panting and staring at me, she allowed it into my bedroom last night so she could watch tv with it. At least the thing went back to it's cage in it's own home overnight. But it's back again this morning....and this will continue through Sunday. I can't wait for Monday to get here. What a cool art image. It really looks like a painting and will make a stunning decoration for the wall! Of course we wuld CK. Yous be very bootyful and wuld make our wall look amazin'. Weez puttin' da finishin' tuches on packin' fur BlogPaws this weekend. We like what you did with that picture, CK. You look great as a watercolor. Love these effects, beautiful art! You look a little upset on your picture ! but the effect is nice !